Why do scientists continue to roll out this ‘pseudo scientific‘ dribble as grand announcements of newly discovered facts. “OUR world orbits a sun located on one of the arms of the Milky Way, a galaxy of some 200 billion stars with spiral limbs that whirl around a thin disk. But how did the galaxy develop those famous arms? A new theory, aired overnight, says they formed after the Milky Way was whacked by a dwarf galaxy, sending cascades of stars flying to the galactic rim. Science can’t reliably predict tomorrow’s weather yet they confidently make statements of an event that happened a billion years ago. Statements like: “Its punch came from a thick envelope of “dark matter“, the poorly-understood invisible substance that constitutes most of the matter in the Universe, the scientists believe.” Is like saying “we don’t understand how or why it happened but we’re telling you it happened”. 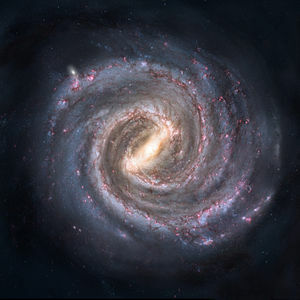 There are millions of spiral galaxies in the known universe. Doesn’t it make more sense to hypothesise that these galaxies were formed by a process rather than a random “poorly-understood” event like a “dwarf galaxy from a thick envelope of dark matter”. Why do we continually get fed this absurd nonsense? Why must we be led to believe that the beautiful order in the universe was created through random events, big bangs and cataclysms rather than any kind of process? Spiral formations have been successfully created in plasma labs. Surely this would be fear more worthy of further research than a bad hypothesis based on yet another a very questionable hypothesis.